Mercedes-Benz has made some revisions to the E-Class, with reduced emissions and increased power outputs alongside a new nine-speed automatic gearbox. Additionally all models will come with collision prevention assist as standard, which will brake the car automatically if it detects an imminent accident. The new nine-speed transmission, called 9G-Tronic, will be available with E350 BlueTec diesel variants of the saloon, estate, coupe and cabriolet. The pairing, along with engine tweaks, brings emissions down to 136g/km for the coupe, 139g/km for the saloon, 142g/km for the estate and 143g/km for the cabriolet. Power is up to 258PS across all body styles, an increase of 6PS. The E220 BlueTec retains the same 7G-Tronic transmission as before but has had its emissions reduced by up to 16g/km, plus a power hike of 7PS to 177PS. E400 AMG Sport models are now called AMG Line and have had an emissions reduction of up to 17g/km. Finally, Mercedes-Benz is offering new accessory packs. 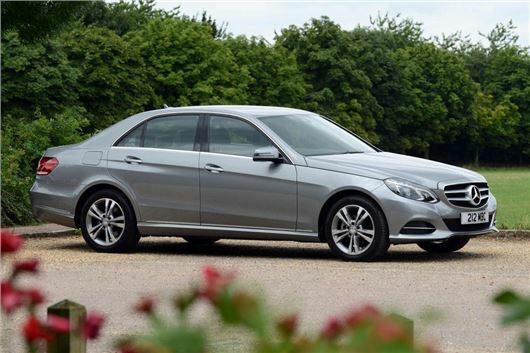 The Premium package for saloon models adds a panoramic glass roof, memory seats package, rear split/fold seats and a reversing camera at a cost of £2695, while Premium Plus adds the Keyless-go Comfort Pack and a Harman Kardon sound system for £3895. love mercs but hate the excessive dealer service costs. Quoted 3 days and £2100 to fix my dashboard. Guys in Waterloovile fixed it in 1 hour at £150.